Best puzzles of 2016 Q3 (July - September)? This question is part of the best-puzzle award series. What are your nominations for the best puzzles, here on Puzzling.SE, of the third quarter (Jul / Aug / Sep) 2016? Nominate each individual puzzle in a separate answer, so they can be upvoted/downvoted separately. No more than 3 nominations per person. Don't nominate your own puzzles. Before you nominate a puzzle, check to see if someone else has already nominated it. If they have then add to that nomination as a comment (or edit it), instead of nominating the same puzzle again. In your nomination, explain what it is that (in your opinion) makes the nominated puzzle such a good one. Is this kind of thing allowed on SE? Yes, Photography SE and Sci-fi/Fantasy SE do something very similar. To highlight and encourage good practice in a way that goes beyond upvotes. To work towards building a 'hall of fame' of some of the best puzzles on the site (perhaps to reside on a future puzzling.SE blog) - think of it as our 'greatest hits album'. To prompt members to put forward their own reflections on what makes a high-quality puzzle. The following is a riddle. Do not solve the riddle. Instead, explain the title. One needs a fair amount of ingenuity and insight to see through the actual solution. Even if one disregards the point above, the riddle has : perfect rhythm and meter, remarkable rhyming, impeccable poetic structure, and apt uses of metaphors and personification. It can be regarded as a example to be followed by any aspiring riddle-writer. Keeping in mind all these constraints, one could imagine how hard it might be to design a riddle that reads so smooth and easy-going. But Hugh Meyers has performed the seemingly impossible task in a way that looks almost effortless. This is a type of puzzle I've never seen on PSE before. On the face of it, it's remarkably physical: given a 3D printer, one could easily create a model of the cube that forms the puzzle. But once the instruction on the cube's exterior has been found, you realise that the solution would be almost impossible without a computer. The puzzle combines so many different elements: it's part visual/physical puzzle, part treasure hunt, and part computer puzzle. The amount of work that went into making this must have been quite extraordinary. 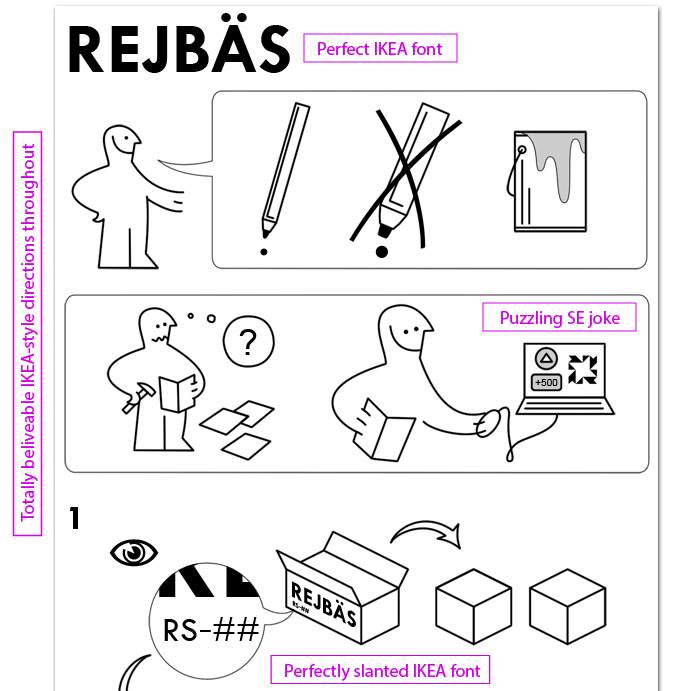 Usually I don't like puzzles which require a computer to solve them, but this one is created using artistic creativity rather than writing skill or mathematical/programming knowledge, and its solution doesn't require any advanced computer knowledge. I also thoroughly enjoyed the group effort solving it. Aside from being a fun, creative, and unique puzzle, I think this is a testament to taking the time to polish something before posting it. There are so many details that add to the verisimilitude of this one (some examples below) but also it's worth nothing that for a somewhat complicated multi-step puzzle, there were no "oops" or "clarification" posts, or even really "hints". I think we all get excited when we're getting close to posting a puzzle, and it takes some restraint and care to take those extra couple minutes, hours, even days to make sure everything is just right. I'm sure Alconja could've posted a pretty cool version of this a day or two before this came out, but kudos for taking the time to post a very cool version. It's hard to come up with simple yet challenging puzzle mechanics, but I think Deusovi succeeded nicely with this one. Clean and pleasing visual presentation (including being colour blind friendly) belies a deceptively challenging visual logic puzzle. Not the first time I've nominated one of BmyGuest's puzzles (and probably not the last - in fact there were a couple of others of his this quarter that I could have chosen in this one's place), but this one stood out to me as an idea that was not only clever and original, but one that could be the core idea for a range of future puzzles as well. It's one of those puzzle mechanics that hits all the right notes - it's not immediately obvious where the solution lies, but it draws you in with a clear-ish starting point with something to chip away at, and (most importantly) has an unambiguous and obviously correct conclusion when you get to the end. A clean and simple wordplay puzzle, made great by its multi-layered construction and its charming and polished presentation. Even if you weren't interested in the story, you can gloss over it reading just the emboldened text and get straight to the meat of the challenge. Magnified images reveal a comely species of maze within the previously-unknown “honeycomb hint” genus. The specimen on the right has a clue-words$:$digits ratio of 500&hairsp;$:$3 based on current estimates of 1,000 words per picture. 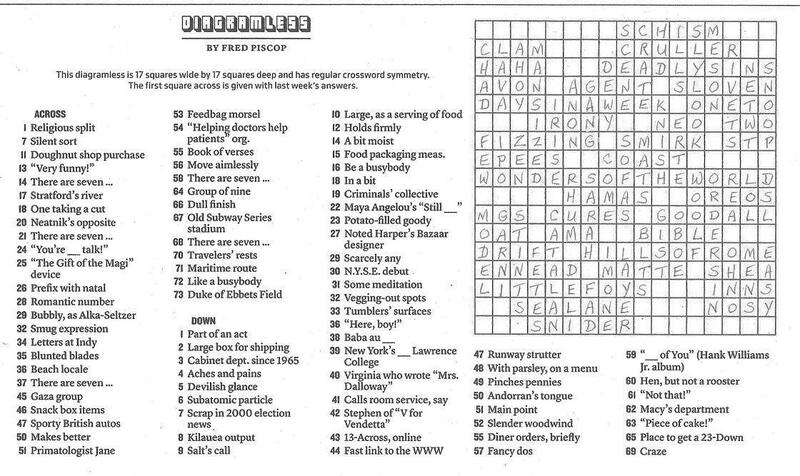 Move over, Hidato, Numbrix and diagramless crosswords, and exalt Honeycomb Hints. 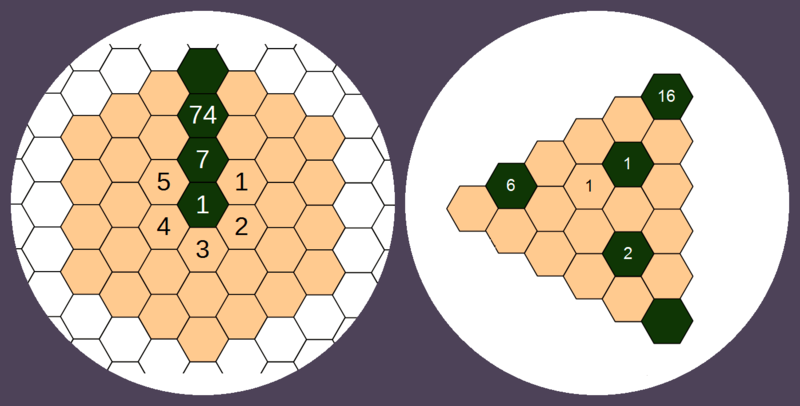 &hairsp; Introduced as a number sequence with only three terms given&hairsp;—&hairsp;normally considered heretical at Puzzling SE—&hairsp;the overwhelming essence of Honeycomb Hints is a sweet new genre of self-constructing mazes. Even when the secret rule is known, a specimen as simple as the 21-cell triangular honeycomb magnified above can have a satisfyingly enjoyable path to solution. Also gotta love the way these puzzles can be copied onto paper in seconds† and require no further technology to solve. Potent challenges within small arenas are made possible by having a set of individually-ambiguous simple combs that mutually force unique results. Each adventure hopscotches multiple islands of solution that grow to meet each other for completion. I plan to propagate this genre and hope that others do too so that we can enjoy solving more of these. † Drawing circles instead of hexagons is recommended for expedience. 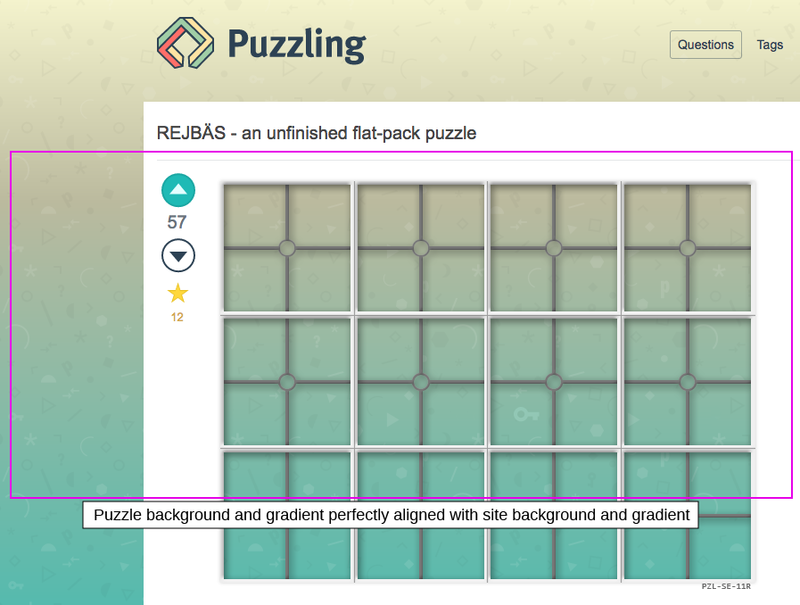 A beautifully crafted puzzle; Multi-layered puzzle and wonderfully presented. This puzzle had enough elements to hold the interest of the solver. A pretty combination of maze and knowledge of computers hits all the right notes in this puzzle. This would have taken an extraordinary amount of time to compose and that wicked red herring at the last part just makes it all the more sweeter in my opinion. This are the types of puzzles you would crave for and hope to emulate in the future. The effort put into this one is definitely as huge as the image files attached to it, this is clearly visible at the first glimpse. It is almost frighteningly grandiose and nerdy, but hey, what do you expect from a computer puzzle with so many layers?! It was also very nice to see how a small community started to build itself around this puzzle, where the wannabe-solvers shared their ideas and used those to push each other step-by-step closer towards the solution. It was really cool to be part of the common discovery. I'm aware that this puzzle was originally posted in Q2. However, the community of solvers got stuck quite soon, and the post had a renaissance three months later. The true depth of the puzzle showed itself only in August, so I think posting it among Q3 puzzles is just as valid, and lets this puzzle get the recognition it deserves, and which it would not get if I was posting this as an answer in the old Q2 thread. Best puzzles of 2016 Q4 (October - December)? Best puzzles of 2015 Q3 (July - September)? Best puzzles of 2015 Q4 (October - December)? Best puzzles of 2016 Q1 (January - March)? Best puzzles of 2016 Q2 (April - June)? Best puzzles of 2017 Q1 (January - March)? Best puzzles of 2017 Q2 (April - June)? Best puzzles of 2017 Q3 (July - September)? Best puzzles of 2017 Q4 (October - December)?